Been a while since I posted anything, but here's an update to my original CRC-16 class that does CRC-16 with CRC-CCITT Kermit code that I posted over on Stack Overflow a while ago. Unlike the code over there this doesn't have a static look-up table (feel free to get the code from over there if you wanted the static table, but I'm actually not too fond of static look-up tables on example source code though they are more efficient). This one differs slightly (API wise) from my previous ones, mainly because I was using it for checksum'ing smaller bits of data, so I made the ComputeChecksum method a params argument instead of a first class array type. If you have any questions / comments / corrections, post them in the forums. Ok, so here's a question for you that most people should have learned in school, but didn't. You have to answer this without running to visual studio. I'm sure there are quite a few who would choose A, but this is in fact incorrect (go ahead and run it in visual studio now). Most of us when we learned C style programming were taught that pre-increment increments the value before taking the value, and that post increment takes the value then increments. After being taught that, pretty much every professor, every code sample, and everybody under the sun used post increment for every single iterative example in existence. The other day I was working on our video game's content server app. The way its set up is fairly complicated. It basically has 3 modes that it can run in (as a windows service, as a fully blown console shell, or as a windows application). Being tired of writing long ugly blocks of code for command line arg's processing, I decided to build out an object (not at all like my last command line parser class) that would manage the command line args in an intuitive manner. Our company uses code generation like most fish use water. We use enums quite a bit and each enum type and all of their values are stored in a database which is used by the code generation tool to generate 99% of our business and data layer code. Since our code is generated, if we go in and manually add additional values that don't need to be stored in the database, our generation tool will blow away any hand written changes on every build. We would have killed to have something like a partial enum, but alas, no such thing exists. I set out to try to create a "Fake Enum" class that acted and felt like an enum but allowed us to extend it by way of the partial class or inheritance. Well after a little poking around, inheritance flew out the window (just over complex without resorting to some generics base type), but the ability to do a partial fake enum was definitely doable. I've finally seen the light for these little buggers. As I wrote in my original post that I really didn't glean much from the description of lambda expressions that are mentioned in the specification, but I ran across a great article on it on the code project that did a really good job at explaining it. I ran across an article on the code project about a PHP compiler / language extension for .NET. PHP has an extension for .NET that allows you to use .NET resources in PHP code, but this allows you to use PHP from .NET, with support for native PHP API's as well as managed compilation. This project may end up making my article on nusoap & C# obsolete, though it should make writing web services in PHP as easy as it is in C#. What is reflection? Its the image we seen in a mirror. In .NET however its a system that lets you do at runtime what you would normally do in a text editor or visual studio. Like most object oriented programming languages, .net has the concept of a "type." a Type defines what an object is. Whether your using a primitive such as an integer, or a complex data type, each thing in .net has a type that corresponds to what it is. This class is of type Foo. Now this class is basically pointless... Why? Well because it has no members. Actually it does have members because everything inherits from System.Object, and System.Object has 12 member methods some have overloads, some are static, some are private some are protected others are public. For the sake of simplicity, we wont discuss System.Object, but will stick only to Foo. Typically we'd never have a class that looked like this. After all, the complier would never let us access Foo::a because it is a private member. What does this have to do with reflection you may ask yourself? The rules of the compiler do not apply to reflection. To understand reflection, you need to understand what a class is, how encapsulation works (what access modifiers are), what a function is and what variables are. We could go a little further, but thats a good starting point. Lets take our previous class declaration and spice it up a bit. I've given Foo a makeover. It now has a private variable, a public property, a public and a protected method and a constructor. I've given Foo a few "members." On the surface (which I wont scratch much) reflection allows you to access, modify or invoke members of an object. I've been working on a service at work that will end up being this big cluster of servers that all talk with each other. One of the things I needed was a small crc checksum for some of the more compact UDP messages that get sent around. I thought about just using the CRC16-CCITT library I already had, but decided on using the standard CRC16 algorithm. Since I posted the CRC32 and CRC16-CCITT implementations I thought I'd post this one too. Once again I found myself needing another type of CRC algorithm in C#. I found one on code project, but their implementation of CRC 16 CCITT didn't produce that checksum I needed. Come to find out there are different methods to calculate CRC 16 CCITT which use different initial values for the crc. This was used for testing during the time we were looking at the Battlefield 2142 auth token, and were trying to figure out what the last 2 bytes of that token were made of. Battlefield 2142's auth token uses the CRC 16 CCITT with the initial value of 0 (new Crc16Ccitt(InitialCrcValue.Zeros) in the above class. I don't know why its never occured to me to implement the singleton pattern as a generic type before. I've always just created the singleton pattern as part of my class (not that we're talking about a lot of coding here), but it occured to me that a singleton could be a lot easier to implement and spot if I used a generic type. Now, instead of implementing this same thing in every single class you want to act as a singleton, you simply use the generic definition: Foo.Instance.Whatever turns into Singleton<Foo>.Instance.Whatever. Update: I've updated this implementation from using a mutex to using a simple lock (double checked) object. A mutex is pointless for a singleton (which I may go into in another article at some later time) as you can never have 2 separate execution contexts accessing one singleton anyway (which is where you would need a mutex over a simple lock object), and I changed the where T : new() to where T : class and changed the instantiation to use reflection to call the private default constructor instead, which I think is the correct implementation. The past while at work I've been working through some annoyingly overcomplicated encryption issues. The problem is not that Triple DES is all that complicated or annoying, it's just that when you have 2 different technologies (one doing the encrypting and one doing the decrypting) at work; it can be frustrating to get anything accomplished. Our issues stemmed around the fact that we were using .NET 1.1 and they were using Java (with the standard crypto providers). There are a few subtleties between Microsoft's crypto providers and Java's. .NET provides 3 (ok, really only 2) Padding modes, and Java provides like 5, but they don't provide any in common. One easy padding mode is to append 0x00 bytes to the end of the final block to make it an even 64 bits wide. The Java provider didn't have this, but its easy enough to add ( by appending null char's '\0' to the end of the string then calling getBytes() ). So that's the route we took. After overcoming a few problems with "How do we encode our bytes used for the key and IV and still be compatible" we were off and running. That made me wonder how compatible PHP and .NET's 3DES were. Since I didn't see any "Padding Mode" for PHP's, I simply hand coded the padding the same way we did with the Java code. Last week I was writing a service that could be run as a console app. I needed to be able to parse a single string into an array like the shell does for command line apps, and the service does for start parameters. I did a little googling, but found only command line arg classes that put command line args into associative array's for easy indexing, which isn't what I was looking for. It had to escape spaces that were quoted (as well as quotes that were escaped). First I tried to iterate through the string a character at a time, looking for spaces keeping the state of whether we were inside a quote or not, whether the current character was an escaped quote, and so on. That was a major pain, so I stepped back and rethought my algorithm. this is what I ended up with, which was much simplier, and did exactly what I wanted without a lot of fuss. The Common Controls library from the Platform SDK provides a control that Microsoft failed to provide a .NET counterpart to: the IPAddress Control (known as SysIPAddress32). I had a much better implementation back then (with quite a few nice things included), but the hard drive that it lived on has since died, and I just haven't wanted to spend the time putting all that stuff back into the control. Some time after having written the "nice" version of this control, I posted the following code to another website. Now, it's all I have left of the original. There is a known problem with the handle to the font being disposed incorrectly, but the code that fixed that, was given to me by jfo from Microsoft, and I did a cut/paste of the solution without really paying much attention to it (kind of regretting that now...). You may notice that all "system" fonts will always be displayed in BOLD in the forms designer (even when the font is set to something else). THIS GOES AWAY AT RUNTIME, so don't worry! It's only a problem in the designer. It does have one wrapped event from the original control and that is FieldChanged, which provides feedback when each octet is changed (similar to TextChanged for a text box, but only fires after the user has entered the entire text for that octet). Likewise, if the value of that octet is larger than a byte, it is automatically changed back to 255 (or the max value of a byte). When the event fires, it passes back, the Octet that was changed, and its value. You can specify the IP Range (which the original control allows, and I've wrapped into this control as well) so that you can edit the control to only accept a specified IP Address Range. I've also provided Native Clear functionality as well as the IsBlank from the original control. I added a System.Net.IPAddress property so that when accessing the IPAddress of the control, you didn't need to parse the System.Net.IPAddress every time. My original control completely removed the "Text" property so that you got and set the IPAddress through this property, but alas, that functionality doesn't exist in this control. UPDATE: 8/25/2006 - Made 2 changes to the source code. 1. added some Initialization logic to keep InitCommonCtrls from being called multiple times and, 2. added styles for ClassStyle, StyleEX and Style to keep an exception from being thrown in certain cases when a WM_GETTEXTLENGTH message was sent. For questions, comments, bugs, or anything else in this control, feel free to use the Windows Controls section of the forum here. I know I'm a bit late here, but better late than never. I've been reading over some of the changes to C# for version 3. I had heard that v3 would be v2 with the addition of the new WPF, but looking over the new spec (well, fairly new anyway), there is quite a bit more. Implicit types, method extensions, lambda expressions, object / collection initializers, and LINQ... C# is going to look really weird! So much for simplicity. so foo is implied to be of type string, and bar is implied to be of some numeric type. Notice that SayHelloToSteve() and SayHelloToSomeone(string s) are not member methods of the Bar class, but are invoked as if they were (by virtue of the Method extension defined in Foo that are available to Bar). This seems like a feature that will be abused to defeat inheritance (by adding reflection to the method extenstions to manipulate internal class memebers without inheriting and changing functionality of the object) that would otherwise look odd and ugly. At this point lambda expressions dont make much sense to me, but it seems its a way to define more than one method body in an anonymous method. Then there's LINQ: which feels something like SQL for C#. Code Zulu Bind Maker is a project I started working on about 3 years ago. Its a stupid little app that configures game settings for Counter-Strike. When I wrote it, version 1.6 was in beta, and everybody played version 1.5 (which was ever so different). Anyway I run a website that supports the app, and of course, its written in PHP / MySql (my poison of choice on the web). The reason for the boring and seemingly pointless background is that ever since I wrote the app, I always wanted to integrate the website and application, but never really thought of a "good" way to do it. A couple days ago, I had some spare time and sat down to see how easy it would be to create some PHP webservices that I could easily consume in C#. I had been considering expanding the community aspect of the bind maker website into the application so that they'd work seamlessly together. I also wanted to add a common place that gaming communities could spend their time (which I had previously planned for just the website, but was thinking of the possibilities of bringing that into the app as well), and a PHP webservice combined with a C# windows app seemed like the best option. C# webservices (server side) are about as easy-as-it-gets to write. C#'s SOAP client is completely transparent (or I should say completely generated so you code just like you would use any other objects) and is completely brainless to use. Since I'd never done webservice work in PHP, I started asking Mr. Google how it worked, and what would you now but that I stumbled across the NuSOAP library for php. It sure beat the heck out of writing all my WSDL files by hand, wrapping and unwrapping stupidly simple SOAP messages, and hacking everything very poorly. NuSoap was great. It took care of all the nitty-gritty work that I had previously done myself. All it took was about 8 lines of code to set up the SOAP server and register the method and my types. // otherwise leave this data blank. This article was first written with visual studio 2005. 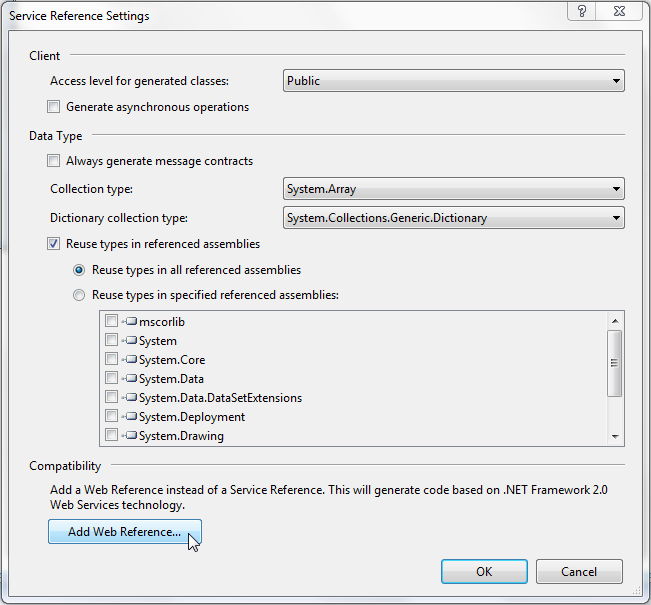 Visual studio 2008 and 2010 no longer have the "Add Web Reference" menu item. 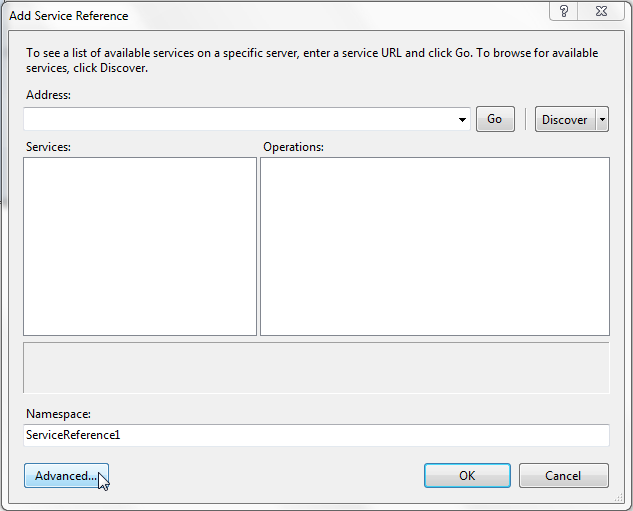 Instead they have an option to add a service reference. 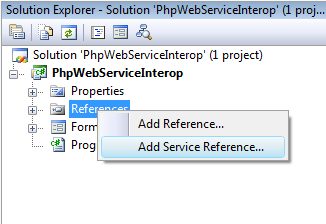 Selecting this option ends up generating a WCF C# client proxy, but we'll want to use the asmx style web service client proxy, so we'll navigate to the add web reference dialog which is hidden deep inside Add Service Reference dialog. Here's a little tool I wrote a while ago. Right now its only for .NET 1.1, but I'm working on a port for 2.0 (which should look a lot nicer). When I wrote this, I was dealing with assemblies that had very complex inner-dependencies. Some assemblies were private, others were shared, and I ended up having to have a ton of ildasm.exe's open to the assembly manafest to try to see which assembly had referenced which assembly and had to verify that the assembly version referenced was correct. On top of that I needed to verify that assemblies that were referenced--that had policy files--were being redirected to the correct versions. Basically all this tool does, is load an assembly, display its version, and lists any referenced assemblies, their versions, and whether or not the reference version resolves to any other version. It doesn't look like much, but its saved me a lot of time and head ache. It also has a copy / paste feature that can copy selected listview data to the clipboard in a nice column formatted manner. Service pack 1 strikes again. Nothing like being incompatible with the same version of the framework eh? Ok, it's been a while since I wrote about anything, so sue me! Today's topic is an interesting find (at least to me)... When you serialize an object that has events (or a delegate) that have been assigned a value (and that value is outside of the class containing the event or delegate), .NET's binary serializer will attempt to serialize the enitre object who's function is assigned to it (it's an interesting thing to think about why they attempt to persist the event association as well). Said more simply, it will attempt to save the class being serialized, as well as all other classes who contain function definitions for those events or delegates. BigDeal serializes perfectly into the memory stream and therefore to the byte array. is not marked as serializable.